In response to a growing need, the Philippines programme has increased significantly. To date, 200,000 trees have been planted. The programme began to grow with the providing of agroforestry training, and through the provision of seeds increased training on livestock management and encouraging the diversification of livestock. Projects aimed to counter the need for local people to purchase damaging and polluting chemical pesticides; this goes together with the government’s relocation project. The relocation project aims to encourage people from poor urban areas to move to rural locations where they can focus on agriculture to support themselves and their families. 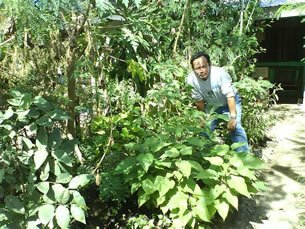 The Filipino government has assisted our partner organisations in accessing land grants. These are conditional upon the reforestation of the land to which they are allocated. The global recession has hit the Philippines hard. In the largest cities of the country, people have been forced to move into ‘squatter areas’ through mass unemployment. With so many jobs in the technology sector now being outsourced to India and China, people are returning to agriculture as the growing industry to support them. With a renewed focus on agriculture, mass deforestation is making this unsustainable. Whilst desperate people seek methods to increase production, slash-and-burn farming is now commonplace, and further damage is caused as the land is stripped of trees to provide building material and firewood. Furthermore, there is increased use of harmful chemical pesticides and fertilisers to increase harvests on land that cannot sustain such intensive farming, and these pollutants eventually end up in the sea causing further damage, such as coral bleaching. In the first instance, the response was targeted at local people: providing training and education programmes to farmers in agroforestry and livestock management, and also providing seeds. The planting of multipurpose, fast-growing trees has addressed some of the soil damage on hillsides, whilst also creating a source of firewood that is sustainable. New varieties of fruit and vegetables have brought a premium to farmers at markets, and education on how to make organic fertilisers and integrate various plant species has reduced the need for chemical pesticides and fertilisers. Unpredictable weather, including a series of typhoons and then periods of drought, brought unique challenges to the project. 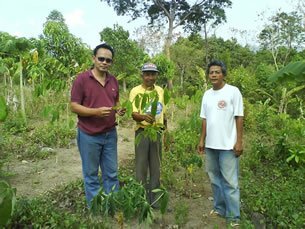 Despite these setbacks, our partner organisations managed to plant 200,000 seedlings. Additional people were employed to ensure the seedlings were watered in nurseries and protected from wildfires. 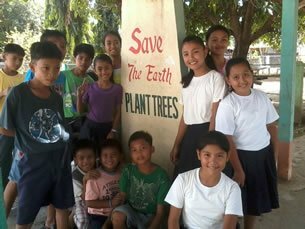 New volunteers, originally recruited through concerns about flooding and deforestation in the Philippines, have since been trained and have assisted in creating new nurseries and outplanting.